This is an original icon from around 700AD. The owner blessed me by allowing me to photograph it. It is about the size of a Silver dollar, you can see the nail holes where it was nailed to an alter or religious book. This is an example of Cloisonne on gold. It is one of a pair of beautiful cufflinks created by Jean. This is one of the first projects in the class. It is a jewel on fine silver. 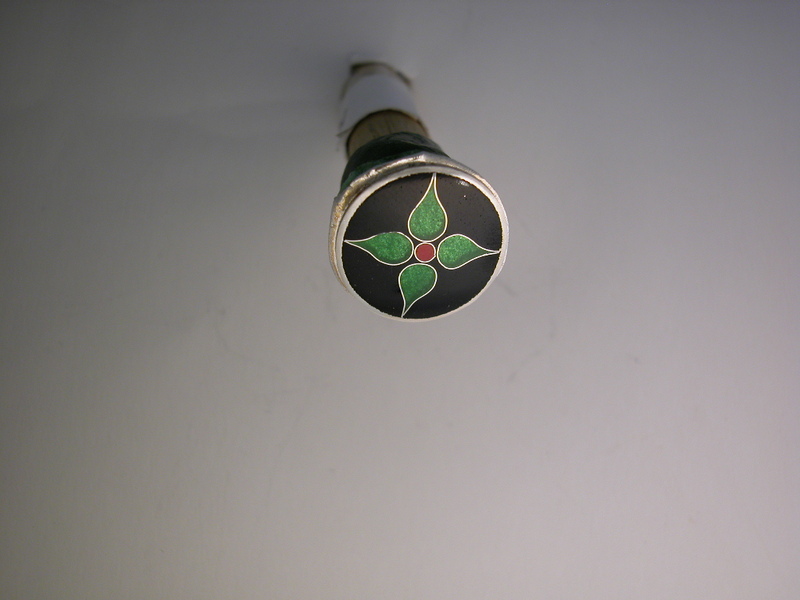 It is still attached to the dop stick for polishing. Around 1450 BC Mediterranean goldsmiths developed a technique that adapted the Egyptian cloison (partition or cell) structure which used inlays of gemstones cemented in place, to enamels (ground glass) which were fused with heat into cells in the metal structure. This was the origin of cloisonné enameling. In this technique, fine ribbons of pure silver or pure gold are formed into a pattern, then attached to a fine silver base to form cells which are then filled with enamels and fired until the glass has melted. The cells are filled and fired again and again until the enamel is up to the tops of the wires. The piece is then ground and polished. By the eight century, AD the technique had developed into a highly sophisticated form of expression and the enamels being produced by Byzantine artists through the twelfth Century AD, were and are among the most beautiful examples made. The beginning students in this class will start with an elegantly simple Byzantine design, apprenticing themselves to the masters. The intermediate students will investigate a 20th Century cloisonne version that is closely related to a three-dimensional illusion painting by making an apple, a pear and/or an iris. Jean will be teaching a 5 day course in basic and intermediate Byzantine Cloisonné Enameling Techniques. At the end of this course beginners will have obtained sufficient enameling knowledge necessary for Jean’s Monarch Butterfly Class. Cancellation Policy: You may cancel up to 30 days prior to the class for a refund less $50.00. If cancelled after 30 days there will be a partial refund of $225. Cancellations made 10 days prior to class will not receive a refund. Please sign below stating that you understand and have accepted the cancellation policy. Cost: $425, There will be a discount if taking both classes. Jean's next class will be in Hilton head SC, on October 25th - October 29th. 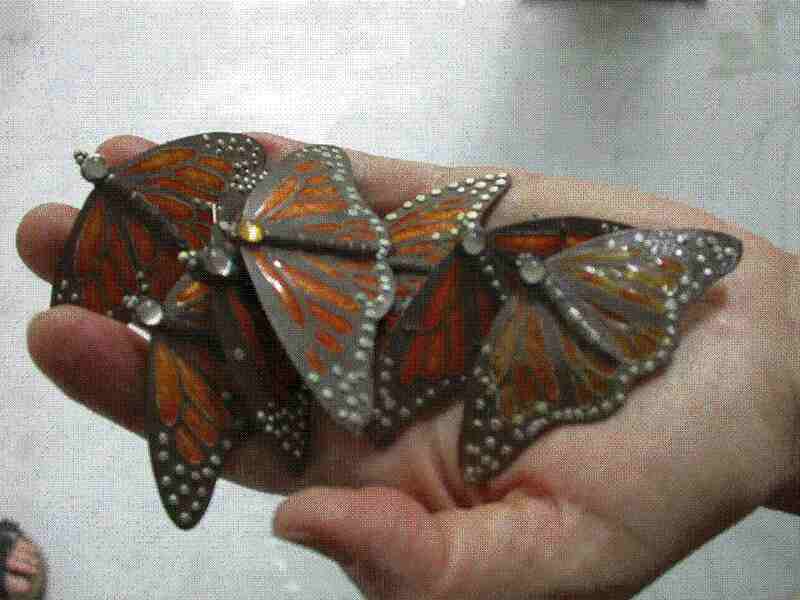 It will be a class on creating a Monarch Butterfly, using enameling and granulation. The skill level is intermediate to advanced. For details or questions, contact Irma Colburn, telephone 843-422-0799 or email irm711@aol.com. "All the participants of the first, experimental class, loved it, and everyone who saw the project at Wildacres (because we all wore them) was very enthusiastic." These were all done by the participants in the first experimental class who were very enthusiastic about the project and the process. The Monarch Butterfly class requires the student to think and to know how to pierce, granulate, enamel, solder, file and sand. silver This is a challenge class that goes beyond instructions. Class will be held 9 to 5, with studio time in the evening. The class is limited to 12 students maximum.